The many merits of Santiago’s colonial milestone. There was a time when the church of San Francisco was the unmistakable symbol of Santiago; its image was featured in practically every painting, illustration or postcard of the capital. Even today, when skyscrapers and vineyards seem have replaced the old church as the new attractions of the city, it would be hard for most Santiaguinos to dissociate their hometown from this iconic landmark. The Iglesia y Convento de San Francisco bears a special significance not only as the single oldest construction in the city, but also as one of the finest vestiges of Chile’s colonial past. The church’s history is linked to the very origins of Santiago. The Order of St Francis settled here soon after the first colonisers in 1554 and were entrusted with the running of a little chapel sheltering the Virgen del Socorro, a precious carved figure gifted by the city’s founder. After the original structure succumbed to an earthquake, the construction of the present-day church took place between 1586 and 1618. Though it has kept its aged walls, the exisiting church has been subject to modifications over time. Most of the nip and tuck has aimed to reinforce the structure following each earthquake which has shaken it and it’s still possible to appreciate how several layers of brickwork sustain the building. This is clearest at the entrance facing the plazoleta. Other interventions have been mainly ornamental; the bell tower and spire is a 19th century addition by architect Fermín Vivaceta. The interior of the church remains scarcely decorated woodcarved figures hanging from the bare-stone walls. Perhaps the only feature worthy of mention is its wooden roof, beautifully decorated with flower motives in gold and pasty green. It is in fact the annexed convent, and not the church, which warrants most of your attention. The convent, which now houses a splendid exhibit of colonial art orMuseo Colonial de San Francisco, is a location which should be well at the top of your sightseeing priorities. From figurines, dolls and silverware to paintings, tapestry and furniture, this is not only Chile’s finest showcase of colonial art, but quite possibly the largest. The east wing of the convent contains mainly altar pieces and religious art, though there is a noteworthy collection of artefacts such as whips, rods, spiked metal ‘cilices’ and all the sort of frightening instruments once used by Franciscan monks. On the west wing. the rooms contain an impressive selection of silverware, among which are some splendid silver chalices. The museum also features some gruesome woodcarved effigies, many of them accessorised with natural hair, mother-pearl, embroidered dresses. Finally, the rooms at the rear of the convent are the true jewel of the crown. With their dozens of massive paintings depicting the life of Saint Francis, this collection is a gem of baroque Spanish-American art. The atmosphere inside the corridors and courtyard of San Francisco is simply surreal. Its overgrown gardens and the roaming cockerels make you feel as if you had suddenly left the city for a forgotten mountain monastery. Alas, the exit from the bucolic calmness of the cloister gardens to the outside world is a bit of an anticlimax. The Great Synagogue of Santiago on Calle Serrano. The area instinctively dubbed as Barrio Paris-Londres is an elegant, if strangely sterile set of sidestreets that lack the basic components of what one could call neighbourhood life. The reason for this is that the south side of the Alameda has often fallen victim to outrageous planning projects, such as the uprooting of Santiago’s legendary Flower Market, la Pérgola de San Francisco in early 1900s. These days, the cobbled streets serve more as film sets than as residential area, although the number of hotels and cafés that have sprung up in the area have cheered up the place with foreing visitors arriving in large numbers. But step beyond the small boundaries of the manicured Calle Londres and Calle París and you’ll face the sad reality of urban neglect. Here, entire blocks of buildings have been destroyed by quakes and replaced by either ghastly constructions or car parks (a profitable business given the proximity to the historic quarter). Still, there are one or two interesting places to see. On the corner of Calle Tarapacá and Santa Rosa lies a distinctive scarlet-coloured colonial house, with a small tower raising above it. 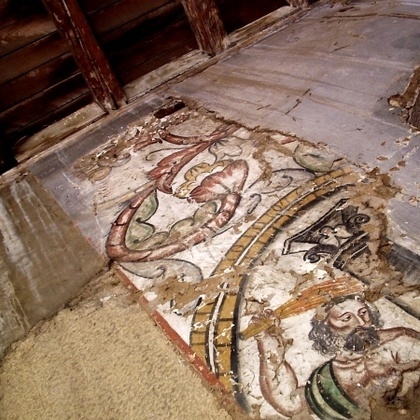 This unique construction (not, in fact, a colonial remnant but a mid-1800s fake) was once the residence of a prominent group of artist, the Grupo de los Diez (the Group of the Ten) which included poets, painters, sculptures and musicians. These so-called Colectivos de Arte were fashionable and numerous in Santiago at the turn of the 20th century, and ‘los Diez’ were among the few that actually shared a living place. The now denominated Casa de los Diezwas, hence, a sort of middle-class squat, where influence could be shared between artists of various disciplines. Further on Calle Tarapacá and at the corner with Calle Serrano lies the Great Synagogue of Santiago and the Israeli Cultural Centre, two handsome 1930s art-deco buildings adorned with moorish elements. 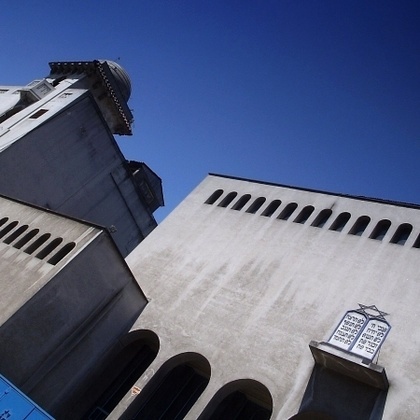 The Serrano Synagogue is the country’s largest and most important synagogue, serving the community of nearly 20,000 Chilean Jews living in the capital.